For new moms and dads, whipping up a from-scratch, organic meal may not seem like it’s in the cards. Working parents, especially, may find it difficult to balance the demands of a new baby and a job. But baby food delivery services like Lilly & Bella aim to make it possible for parents to prepare nutritious meals for their baby or toddler right at home. The ability to skip the grocery store is just one of the benefits of the weekly, subscription-based service, which delivers organic produce and recipes to parents' doorsteps. Parents of little ones may appreciate the service for its ability to gradually expose kids to a variety of different foods. Just as meal kit delivery services for grown-ups seek to add variety to an adult’s diet by delivering new genres of food, Lilly & Bella aims to expose kids’ palates to new foods. Upon reaching the last of the service’s four stages, kids will have tasted more than 30 different fruits and vegetables. Lilly & Bella also seeks to eradicate the stress of meal planning by including recipes that can help make cooking a meal from scratch a breeze. Lilly & Bella subscriptions are currently only available to residents of North Texas, but similar services have begun cropping up all over the U.S.
Ayesha Curry’s new meal delivery service, Gather, includes a baby food add-on. Like Lilly & Bella, its goal is to expose kids to the types of food that mom and dad are eating. For residents of Los Angeles, there's Caer: a baby food delivery service that offers nutrient-dense, low sugar food. 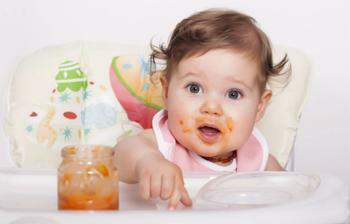 New Yorkers with babies or toddlers can get their organic baby food delivered from Shoogles.